How to get started in a golf career? What kinds of clubs does Tiger Woods use? What is Tiger Woods full name? Kristy in B.C. asks: I want to know how to get started in a golf career? Scott Robbins: Kristy, What a great question! There are many ways to get started in a career in golf. At your age (16), other than playing for a living, there are some great options for you. There are more and more colleges nd universities offering the Professional Golf Management Program (PGM) throughout the United States. Ferris State was the first school but there are other schools offering the program like New Mexico State and Mississippi State. These programs will help train you in the golf business and help place you in internships and assistant professional positions after you have graduated. For more information on the program, check out the PGA Home Page at http://www.pgaonline.com. Scott Robbins: Mike, I am not sure about all the equipment Tiger is currently using. I know he has played with Mizuno Irons, either the MP11 or MP 29 model. I think all his wedges have been Mizuno. I seem to recall him putting with a Ping putter and hitting Callaway woods. His new contract with Titleist will probably have him changing equipment next year. For more equipment information you might try and search the Web for Golf Magazine, Golf Digest magazine, and Titleist web pages and they probably have more of that info. – Chris Schroeder of Cedar Rapids, IA writes: I am doing research on golf and must report on a golf star. I would like to know more about Tiger Wood’s personal life. Where does he live? Parents? Siblings? How long he’s played golf? Hobbies? etc? Scott Robbins: Chris, I don’t know all the answers you need, but I will attempt as many as possible and cite some other sources you might try. I believe Tiger stills lives in California. His father and mother are still living. His father is an African American and his mother is Asian, I believe from Thailand. He is an only child. His father first had a club in his hand when he could walk at less than a year old and he was playing golf at age 2. Other than that, I am unable to be of further help. However, contact the PGA Tour office and see if they can send you some information by fax or mail. Also, surf the Internet for Golf Magazine, Golf Digest and other publications that would have these answers from their reporters. – Brad Lynch of Essexville,MI asks: How can I correct my slice of the drive? A correct path around and away from your body combined with a square clubface at impact will stop that slice. If you can find a PGA Professional close by, have him/her check out your golf swing and listen to and heed the corrective instruction that he/she will give you. The late great Harvey Penick said that once a student started hooking the golf ball, that was when they could really learn to play golf. Good luck with trying and finding your changes, that I am sure will make your game better. – Erica Hansen of Cloquet, MN asks: What is Tiger Woods full name? Scott Robbins: Erica, his full name is Eldrick Tiger Woods. His father named him for a friend he was in the Viet Nam War with. – Taylor Mason of Sac City, IA writes: I’ve been play golf for 3 years. For 9 holes I have lowered my score from the mid 80’s to the mid 50’s this year. I have a problem of going to the right 75% of the time. I am right handed. Dad says it is not a slice but a set-up problem. Do you have any ideas? Scott Robbins: Taylor, there are some check points you can make in your set up and finish that can start you on the right track. Since it is school time, let’s use the alphabet. First, since golf is a game of sending a ball at a target, let’s get you aimed first. That is the letter “H.” The side of the “H” furthest from you or on the right side is your target line. The side closer to you is your body line. The cross bar is your golf club. To be sure your “H” body is right you have to stack your “V”‘s. The big V is on the bottom and is upside down. The tip of the “V” is a your chest bone and the sides of the “V” run down the insides of your legs. The upper “V” has your arms as the sides and your hands (held together as your grip) as the tip. These two “V” should fit right on top of each other. The second letter we will mention is “k” and you should notice it is in lower case. This is what you want your body to look like at finish, except backwards. The straight line of the reverse “k” is your body. The bottom slant line is your right knee touching your left knee and the top slant line is your club over your left shoulder at finish. Use these to check out your form. 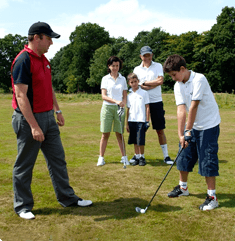 Find a PGA Professional who does junior clinics during the school year and attend some. He/she can help you with all your fundamentals. Good Luck and stay with golf. It is the game of a lifetime. – Chris Damman of Grosse Pointe Shores,MI writes: I have been playing for a year and a half and I have improved my handicap by ten strokes. I just bought a new set of clubs and a driver, when I first bought them I felt very confident, but as I went on I had a swing technique problem so I lost my confidence. How can I regain this? Secondly, with my driver, a titanium burner bubble, I have been hitting a fade and I have heard that a fade reduces distance, I’d like to turn this into a fade. How can I do this? Scott Robbins: Chris, as you grow and start playing golf more frequently, golf clubs become a big factor. Unfortunately I have seen too many young (junior) players who are too anxious to get a full size set into their h nds. A lot of times, and I would say most of the time, that set is too long and too heavy for the junior to handle. The reason I say this is that the usual result is that the junior begins to use he hands and arms incorrectly swinging the club too far inside on the backswing and then chopping down and across the ball at impact causing a slice spin. What then can be done? Get to a PGA Professional who can evaluate your clubs and your swing and recommend how to best utilize what you have in equipment and a swing. If you are continuing to slice now (without lessons) it usually means your clubface is open and your club is traveling across your target line from outside to inside. A quick way to try and straighten it out would be to try and wing the club opposite of where it is now. Try and swing the club from inside to outside through impact. Get to an instructor soon. The sooner, the better before these habits become too difficult to change. – Cody Darley of Utah asks: How can I stop pushing the ball? Scott Robbins: Cody, if you are straight pushing the ball (without a curve to the right or left and just straight away from your body) then it usually means the club is traveling on too much of an inside path into the golf ball and/or the ball is to far back in your stance. To correct that there are a few good drills. One is to stand with your feet close (2-6 inches) together and try and hit golf balls swinging the club more to the left on the follow through. Another is to play the ball in front (nore towards target) of the toe of your front shoe. Hit golf balls from there. This promotes you to bring the club and body through together to make contact with the ball. Learn to sweep the golf ball. Borrow the broom from your Mom and start to swing the broomstick trying to sweep the ground. Learn that same motion with your golf swing and you will never have problems hitting the ball off the ground again. Go see a PGA Professional for help with your swing. Do it now before you develop habits that you can’t ever seem to shake. Scott Robbins: Conor, Great questions! The best way to find all these answers is to find a PGA Professional who is proficient in clubfitting. Shaft stiffness within your set is based upon two variables, swing speed and swing tempo. Someone with high club head speed might need a softer shaft if the tempo of their swing is slower. If that person swings too stiff a shaft they will tend to try and fight the club and sometimes feel they have to “swing hard” to hit it. The other side of that coin is if someone is swing too soft a shaft then the tendency is for the clubhead to lag the shaft and they tend to push or “hang” the ball in slice territory. What I see in that case is the player trying to adjust the swing to compensate and that player sometimes tries and manipulate the hands or shoulders to adjust for ill fitted golf clubs. You as a player, at any level, will adjust to the golf club in your hand. Therefore it is better to be fit and have a golf club that fits your swing rather than a swing to fit your clubs. The question of tape. Yes, as you add tape, you change a lot of things. You change the head weight and the relationship of that head weight to the rest of the club. That changes the balance of the golf club and the feel of the club in your hand. It is best to know what your are trying to accomplish (i.e. what flex, weight and balance point) before you start adding tape. If you add tape to a accomplish a specific goal it is great as a tool. Good Luck. Find a good fitter. Most good fitters can also tell you if you can get your current clubs to the playing conditions you want or if you need to reinvest in a properly fit set. Find that set that will let you be the best golfer you can be! – Craig Arnold of Lancaster, KY writes: My golf game is becoming more consistent every time I play. I am shooting about 4 over par on a regular basis. I would like to know how to figure my handicap. If you could tell me how, would appreciate it. Thank you! Scott Robbins: Craig, The handicap system is actually a pretty complex and mathematical problem. The best suggestion is to see if there is a “golf club” as the USGA calls them at one of the courses you play regularly that is running a handicap service. Then you can turn in every card from every round and every course you play and you will have an official USGA handicap. To figure your handicap you use the best 10 of your last 20 scores at all times. As you “post” more scores the oldest scores go out. Most courses, if not all have course ratings and slope ratings from each set of tees. To figure the scores you use, you try to get them on an equal ground. Take the actual score you shot, deduct the course rating. Next multiply it by the slope rating of the tees you played and divide that by 113 (the average slope of all courses). Add all 10 of your scores, average them and multiply by .95 (95%) and you will get your handicap index. At each course ther should be a chart where you can take your index and see what your handicap for that course or set of tees will be. I hope this helps. Find an association that you can establish a handicap with (usually only a few dollars a year) is the first choice. Secondly, I think there is some golf computer software that has handicapping capabilities also. – Dan of Garden City, NY writes: I’ve been playing for about one year and my problem is with my short irons. I keep pulling eveything left. Any suggestions for improvement are greatly appreciated!! Scott Robbins: Dan, A pull indicates a swing path into the ball from outside the target line to inside the target line. It is usually made by trying to swing the club too straight towards target. Once you are properly lined up (feet and body parallel to the target line) and in the right posture you will notice that you are to the side of the golf ball. This makes it impossible to swing the club straight down the line. Your swing should always be to the inside and from the inside coming into impact. Start here and also go find a PGA Professional in your area to take some lessons from to learn your swing. The TOUR players do, so it can work for you also. Good Luck, Have fun for the rest of your life playing this great game. 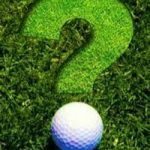 – John of Libertyville, IL asks: Do you know of any junior golf tournaments in Illinois or one of the neighboring states? Scott Robbins: John A., Congratulations on being interested and in a place in your golf game that you are ready to start playing tournaments. Unfortunately, I am not familiar with anything in Illinois. 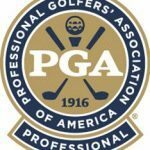 However, contact the PGA of America and search the Home Page at “http://www.pgaonline.com” and check out the Junior Section and see if they have any info. If not there is also a list of Section offices on the Home Page and you can get the Section that covers Illinois and call or write them and get the information on the Junior tournaments that have available. Work hard on the golf game, work hard at school. The combination will take you far.